The process of learning the Alexander Technique shines a light on habitual patterns that interfere with efficiency and ease. As you learn to un-do posture and movement habits that contribute to tension and pain, you practice choosing ways of being and moving mindfully with balance, ease and efficiency. As an active exploration with a teacher, learning the technique is done in daily life activities, from sitting at a computer to walking or exercising, to playing an instrument or meditating. The principles may be simple, but they are not necessarily easy. And it takes a while to integrate them into your life. Most people need about 10 lessons to get a good start on changing the way they sit, stand, walk and do their other activities. New neuro-muscular patterns have to be practiced to become new (healthy) habits. But just like riding a bike, once learned, the Technique stays with you for life. The Alexander Technique works by initially establishing the ideal relationship between the head, the neck and the back while in movement. This “core” of the body supports the limbs and provides the structural environment for breathing and the internal organs. As tension lessens and spaciousness returns, the nervous system is calmed and the state of being enlivens. 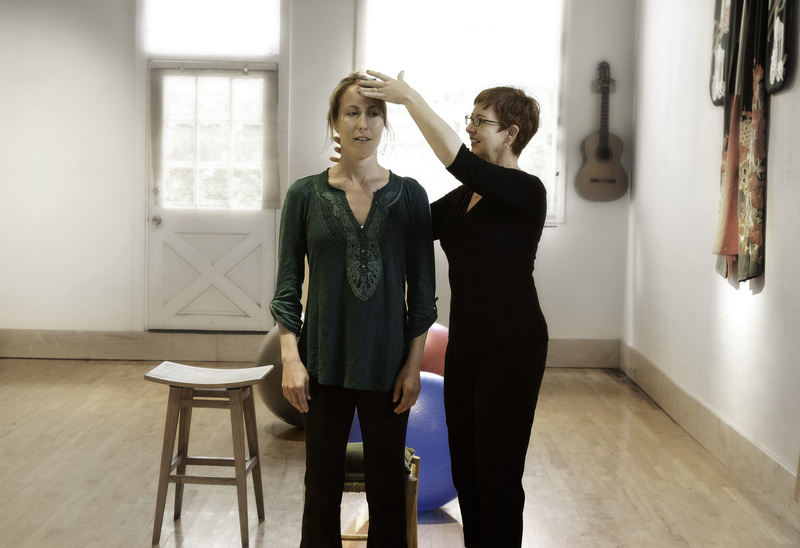 While learning to access this natural relationship between the head, neck and back from the inside, students learn body awareness, spatial awareness, movement awareness and how to calm their own nervous system. Long-held patterns of movement, posture, breath, voice and unhelpful ways of thinking can be released and new patterns of whole being balance emerge. As capacity for somatic embodiment increases, students learn to respond with choice rather than react from habit. “The Alexander Technique is not a method of accumulating information nor the art of learning something new.